Food was bad, the fruit wasn’t ripe. Sometimes the staff seemed like helping us was an annoyance. I stayed here for 5 days, the hotel is beautiful and all the amenities. Everyone here is very friendly. My kids loved the pool, despite that the phone didn't work and for that reason i missed my already paid shuttle to the airport and other things that i will discuss with the hotel staff in private the stay was wonderful. Very clean, staff was always cleaning around resort. Buffet was ok. Loved the Mediterranean restaurant but would not recommend the BBQ restaurant/buffet. Staff could be a little more helpful. Had a hard time trying to figure things out the first couple of days. There should be an information book in the rooms listing all the restaurants/snack area with hours of operations. Immaculate. However, our room AC was poor. The refrigerator did not work. Several bulbs were out, the room key was inoperable on two occasions and lack of towels was irritating. Breath taking..So beautiful and lots to do.Amazing shows.Beach was so beautiful. The staff and service was horrible. It was nearly impossible to request anything and find someone who speaks English. The wait for guest services took half an hour to request a dinner reservation and then we were told everything was booked all week. The food was barely edible. Our room had a toilet that didn’t flush ( we fixed it ourselves), ants in our room, tv clicker that was broken, outlets and lights that didn’t work, and there is no “free WiFi”. We had to pay for it for each phone. Twice we returned to our room to find the door standing wide open when we knew we had closed it. The pool and beach were so crowded if you didn’t get down there by 7:30 am to hold chairs with towels you couldn’t find one by 9 am. The walk from the beach to the main lobby restaurant and to our room was so long it was a commitment. There is no going to get a coffee or a drink. The lines at every bar were long and slow. Positive: beach and weather were lovely. Pros: Staff is responsive and in majority of cases is helpful. Cons: Cockroaches, mosquito in the room. Some staff was trying to charge for the towel card that had not being providing. Variety of fruits is limited. No much of a help from personnel during the health or other issues/emergencies. Long distance to the beach. No free lounges/spaces at the beach after 10 AM. We went there on the third week of January. The resort is very beautiful and as you get there, you feel blessed by being able to taste that magical place. The hospitality there is 0. Almost all of them. If you need something, get ready to wait 1 hour just to re-program the key for the room (ex). I took my wife there for her birthday and one of the main things do do was having dinner by the beach on that day, so we booked it and requsted table to be on the sand (as presented to us on pics). When we got there, table was on the deck, and there was nobody responsible for it, besides a nice boy as "server", se he started moving table closer to the water. Me and the wife of course helped him. Imagine my wife with a nice expensive dress moving the chair. Terrible. There was no candles either. When the next day we went to the lobby to talk to the GM, they said is to late to complain for that now (not even half day has passed).We asked for at least half of the refund for that dinner (which wasn't cheap at all) but they said NO because is not their fault that the guy who made the reservation messed up. SAD. Also, it's impossible to book ala-carte dinners on the restaurants because they say they are fully booked, and when you walk in they not even half filled. The only good thing there was the beach, and the resort was very beautiful. Other than that, customer service and hospitality could have been waaaaay better. Will never go back there and will tell friends not to do so either. Very beautiful hotel, beach beautiful, staff very friendly and helpful. I was very disappointed with the staff. Only a small percentage of the staff speaks English! It was impossible to ask anyone questions because hardly anyone spoke English. The food was average. Nothing great. I witnessed several arguments over saved lounge chairs because there not enough to go around! I will definitely not return to this resort! 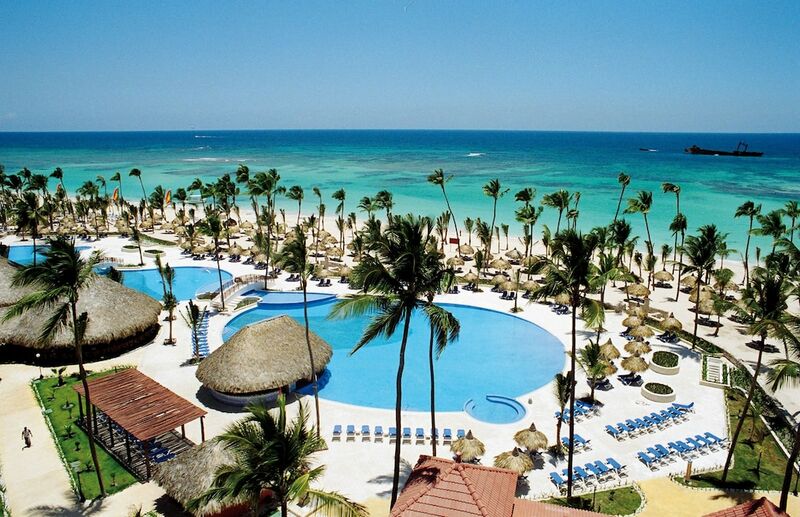 Arena Gorda Beach is within a 5-minute walk of Grand Bahia Principe Punta Cana - All Inclusive while other popular sites like Hard Rock Golf Club at Cana Bay are within a few miles (5 km). This 756-room, 4-star property has 2 outdoor pools along with a full-service spa and 5 restaurants. It's connected to the convention center in central Punta Cana and also close to Iberostar Golf Course and Cortecito Beach. Free buffet breakfast is served each morning from 7 AM to 10 AM. There are ample dining options with 5 onsite restaurants, including Mikado, which specializes in Japanese cuisine. An LED TV comes with satellite channels, and guests can stay connected with WiFi. The pillowtop bed provides a full night's sleep, and the bathroom offers a jetted tub, hair dryers, and free toiletries. Other standard amenities include free minibar items, a balcony, and a sofa bed. Guests of Grand Bahia Principe Punta Cana - All Inclusive have access to a full-service spa, 2 outdoor pools, and a nightclub. If you plan to drive, free parking is available. The front desk has multilingual staff standing by 24 hours a day to assist with concierge services and dry cleaning/laundry. Other amenities at this all-inclusive property include a children's pool, a fitness center, and a spa tub. Mikado - Restaurant specializing in Japanese cuisine and serving dinner. Reservations required. Orquidea - Buffet restaurant specializing in international cuisine and serving breakfast, lunch, and dinner. Santa Fe - Theme restaurant specializing in Tex-Mex cuisine and serving dinner. Reservations required. Garden Grill - Steakhouse. Reservations required. El Pescador - Theme restaurant specializing in seafood and serving dinner. Reservations required. The property has 2 outdoor swimming pools and a children's pool. A spa tub, a sauna, and a fitness center are other recreation options. The preferred airport is Punta Cana (PUJ-Punta Cana Intl. ): 29-min drive, 17.3 mi/27.9 km.